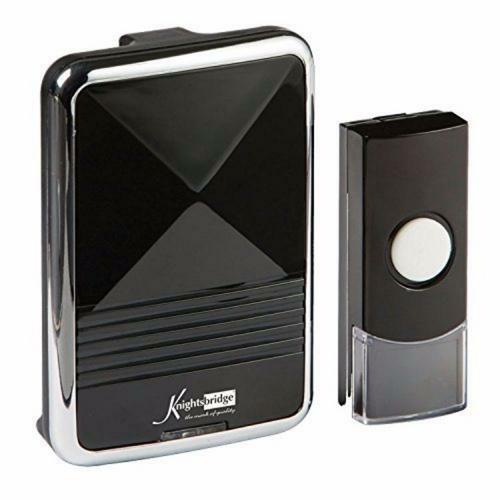 The Knightsbridge DC001 is a versatile wireless door chime & push which requires no wiring. With many handy little options such as 36 melodies, flash, ring or flat & ring it is a versatile package to meet your requirements. Finished in a high-quality Polished Black with a Chrome Effect Trim. 1 Million sets of auto-learning codes to avoid interference..
Ring only, Flash only, Ring & Flash combined Options. Bought this door bell to replace a wireless one with gave up after 6 months! It has so many more options than the old one, I have set it to both ring and flash when pressed (as I am a little hard of hearing)! Have recommended to family and friends who have also purchased. Very fast delivery of the product. Does what it says on the packet. Good volume for it's size and easy to install. I purchased this to enable my disabled and bedbound wife to summon me when she needs help, as she is unable to call out. With the chime located near me, or in my pocket, I can safely be some distance away, secure in the knowledge that its 200m range will ensure that I can return to her side quickly when she simply presses the bell push. Whilst not primarily designed for this particular purpose, it has nonetheless proved to be highly beneficial. We bought this bell system with a certain amount of tredipation. We didn't have to use raw plugs or screws. Just hung the receiver on a picture frame pin in the hall and used two-sided tape for the bell push. Job done. The chime system has some laudable melodies. At last we have a door bell we can hear. can I purchase an additional bell push for the Knightsbridge 200m in black..
Electrical World Replies: Hello , thanks for the question. ive checked with the manufacturer and sorry to have to say they dont supply the push separate. The push they say has been coded specifically to the unit and further pushes wont work on it either. Hi is this unit needing plugged in?